Come aboard the "little sister" of our tall ship fleet, the 67-foot Liberty Star and take a trip back in time You'll be charmed by our fleet from the moment you set foot on board. With a maximum passenger count of 35 you can easily find your favorite spot on deck from which to enjoy the Boston Harbor skyline and settle in for a relaxing sail to escape the hustle and bustle of the city, or use some muscle and haul up sails and maybe even take the helm! Perhaps you'd like to sing a shanty or two with the crew? You will gain a whole new perspective of Boston on this unique sailing experience. Talk about photo ops! This is an ideal way to get out on the water for 1.5 hours. Day sails and sunset sails are amongst the offerings on the Liberty Star or unleash your inner pirate and come aboard the 125 foot Liberty Clipper for the Saturday evening Rum & Revelry Cruise. Also check for Special Events. You can find the Liberty Star by Central Wharf next to the New England Aquarium in Boston Harbor. Sailing times vary as we offer a wide variety of experiences so be sure to check the product list. Once all passengers are aboard, we'll point the ship into the wind. At this point you can sit back and relax or ... flex some muscle! Feel free to hoist the sails - grab the line and help us HAUL AWAY to raise the main sail, fore sail, and jib! You'll get to experience a little of what it is like to sail a traditional schooner with everything operated by hand. 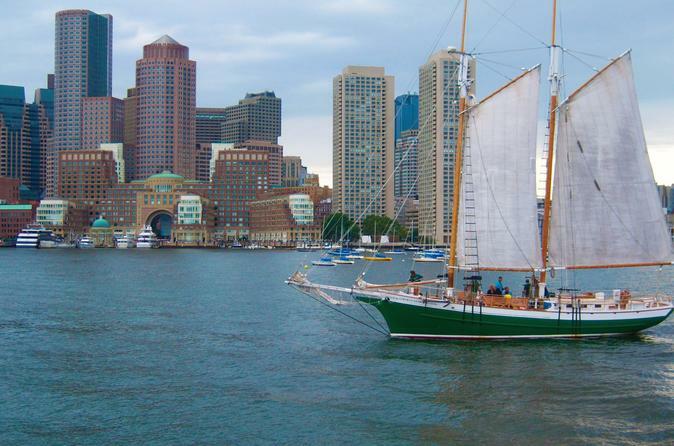 An experienced captain and crew will tend the sails while you enjoy beautiful views of Boston Harbor. Depending on the direction of the wind, we might sail toward the outer harbor and you'll get a look at Fort Independence, watch planes taking off or landing right over our masts from Logan International Airport, and view the Boston Harbor Islands. Or we might head over by East Boston, visit the Charlestown Navy Yard - home to the USS Constitution, and glimpse the white steeple of Old North Church in one of Boston's oldest neighborhoods, the North End. Once the Liberty Star has you nice and relaxed, the crew will tie up again where the trip began and we hope your energy is restored for further city exploration. For harbor sails and sunset sails, drinks and snacks can be purchased on board and a bar is set up as well. It can get breezy out on the water (remember how you wanted to relax and cool off?) so it is helpful to bring a light sweater or jacket (some Liberty Fleet merchandise is available for sale onboard), as well as sunscreen. And yes, there are bathrooms (called 'heads' on ships!) below deck!